For more than a decade, the Law Offices of Deborah S. Perry, PLLC, has provided experienced family law and criminal defense representation to clients in San Antonio and the surrounding parts of Texas. When you are faced with a family law or criminal defense case, you want an attorney who will work hard to protect you. When you choose the Law Offices of Deborah S. Perry, PLLC, you will receive aggressive representation from attorney Deborah S. Perry. Attorney Perry will work with you personally. You will never be handed off to a junior attorney or paralegal. You will have the confidence that comes with knowing your case is in good hands at all times. During your free, no-obligation initial consultation, attorney Perry will take the time to learn about your situation. If you have a family law case involving divorce, child custody or any other matter, she will ask questions about your circumstances and your goals for the future. If you have been charged with a crime, she will listen to your side of the story. Once she has all of the necessary information, she will work with you to design a customized legal strategy. 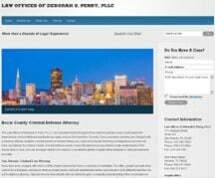 While many cases are resolved through negotiation, Deborah S. Perry is a trial lawyer. If an opponent is unwilling to concede, she will go to trial. She knows how to build cases with the strength to hold up during a courtroom argument. She knows how to find the weaknesses in an opponent's case. As an experienced Bexar County criminal law attorney, I know what people go through if they have been arrested in connection with a criminal offense.